Deer Ferns – fiddle heads are delish! These two lovely plants show us how nature has its own companion planting systems at work and the beauty of how they support one another, rather than taking anything away from each other. 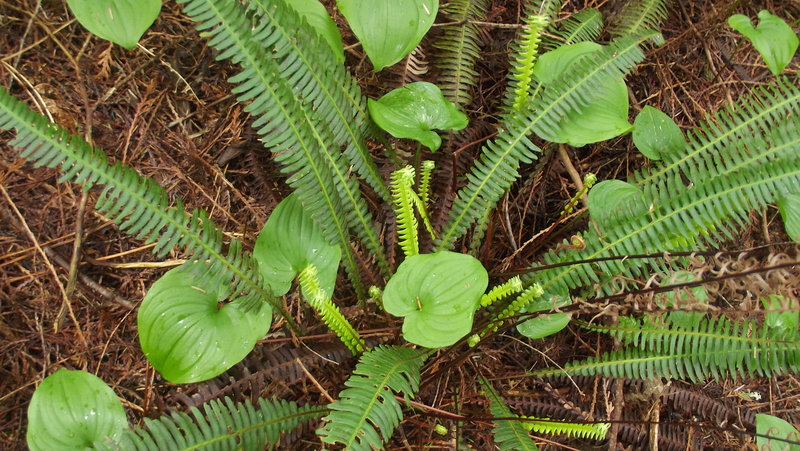 Deer ferns (Blechnum spicant), are so lovely, they are found throughout the Pacific Northwest Coastal regions wherever you find rain forests. they are found closer to wet zones than dry zones. These ferns do not get very tall. They get about 2/3’s up your shins towards your knees, (or up to your knees if you are a smaller person than average, or a child). The tiny little reddish fiddleheads are simply delish! I enjoy eating them fresh off the plants as I pick them. Not everyone does, but i sure do! Wild Lily of the Valley (Maianthemum canadense), is a wondrous plant that grows throughout rain forests in the same places that you find ferns. They are great as an instant bandaid for cuts and wounds, and bug bites. Spider bites included. They have heart shaped leaves and are a deep green. they grow about 3-5 inches high at the most, and have an underground runner root system. once you have a few, you have a network eventually. they grow in groups. never alone. They have similar healing qualities to frog leaf… aka: common plantain (Plantago major). These two little lovely fairy forest plants are amongst many in forests where there are few to no invasive species, but they are seriously at risk from extinction from such plants as English Ivy (Hedera helix), and Himlayan Blackberry (Rubus armeniacus) and Japanese Knotweed (Fallopia japonica), to name a few. Kamala Todd's short doc "Indigenous Plant Diva"